WBO Junior Middleweight Champ Sergiy Dzinziruk made the fifth defense of his title look easy with a dominating 10th round TKO of previously once-beaten challenger Daniel Dawson in the main event of ShoBox: The New Generation Friday night on Showtime from the Chumash Resort Casino in Santa Ynez , Calif.
Unbeaten prospect Vernon Paris narrowly defeated the tough Juan Santiago in Friday’s co-feature with an eight-round split decision victory, scored 77-74 Santiago , 76-75 Paris , twice. Dzinziruk, a superstar in Europe, was more than impressive in his U.S. debut, dominating the fight from the opening bell with his relentless jab. Dzinziruk (36-0, 24 KOs), of Hamburg, Germany, fought safely in the opening rounds and established the jab before becoming more aggressive and punishing against the outmatched, Australian-born Dawson (34-2, 24 KOs). Dzinziruk certainly didn’t look like a fighter who was making his first defense in more than 17 months. 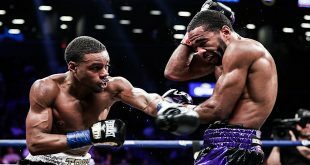 The 34-year-old peppered the clearly defenseless Dawson, 32, with combos and jabs in the later rounds, forcing referee Jose Cobain to stop the fight at 2:12 of the 10th round. “My plan was to use the jab to make him tired and then go to the other punches,” Dzinziruk said. “We saw some tapes of him and knew the early rounds would be tough. Our plan was to apply more pressure in the later rounds and finish him. We’d had a long layoff and we wanted to take it easy in the beginning. Steve Farhood, ShoBox’s expert analyst, agreed. “The jab was a dominating weapon,” Farhood said. “We knew going in that Dawson had to find the answer for it and he never did. Dawson, who was also making his U.S. professional debut, knew he had no answer for Dzinziruk’s most dangerous weapon. While Dzinziruk put on a technical boxing clinic in the main event, Friday’s co-feature was a little more wild and unorthodox. 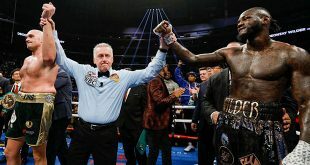 Paris (21-0, 13 KOs), of Detroit, Mich., was clearly the more talented boxer, but he tired towards the middle rounds and didn’t fight with a sense of urgency. 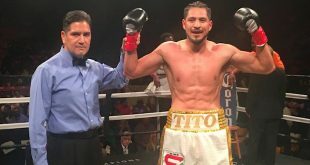 Santiago (2-4-1, 7 KOs), of Denver, Colo., continued to press the action and won the crowd over with his tough and determined style of fighting. A close fight throughout, Paris came out in the eighth and last round knowing that he needed a strong showing to impress the judges and earn a decision. Santiago, who earned a lopsided 77-74 on one judge’s scorecard, saw it differently. “I’m very disappointed,” Santiago said. “I feel like I won, everyone knows that I won. I don’t know what more I needed to do to win it. “I did everything I possibly could do. I fought my hardest. Everyone thought I won that fight". Antonio Tarver, an expert analyst for ShoBox, felt Paris didn’t give his best effort against a tough opponent. “It was very entertaining, but Paris has to get in shape,” Tarver said. It’s obvious he has the skills and the talent, but he has to get committed and dedicated. It’s clear he was the better fighter, but, sometimes, wills beat skills. The doubleheader was promoted by Gary Shaw Productions, LLC. Friday’s fights will re-air on SHO 2 on Tuesday, May 18 at 10 p.m. ET/PT (delayed on the west coast). The fights will be available On Demand from May 19 until June 1. Curt Menefee called the action from ringside with Steve Farhood and Antonio Tarver serving as expert analysts. The executive producer of ShoBox is Gordon Hall with Richard Gaughan producing and Rick Phillips directing.